This is a network of neurons reconstructed with large-scale electron microscopy. A network of cortical neurons whose connections were traced from a multi-terabyte 3D data set. The data were created by an electron microscope designed and built at Harvard Medical School to collect millions of images in nanoscopic detail, so that every one of the "wires" could be seen, along with the connections between them. Some of the neurons are colour-coded according to their activity patterns in the living brain. This is the newest example of functional connectomics, which combines high-throughput functional imaging, at single-cell resolution, with terascale anatomy of the very same neurons. 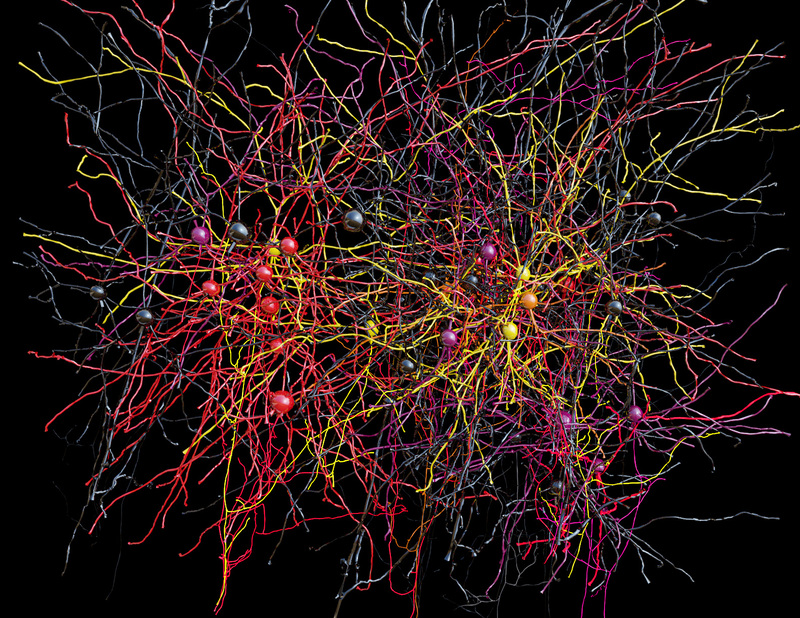 Credit: Clay Reid, Allen Institute; Wei-Chung Lee, Harvard Medical School; Sam Ingersoll, graphic artist.28 Mar 2016 Seattle - Even the simplest networks of neurons in the brain are composed of millions of connections, and examining these vast networks is critical to understanding how the brain works. An international team of researchers, led by R. Clay Reid, Wei Chung Allen Lee and Vincent Bonin from the Allen Institute for Brain Science, Harvard Medical School and Neuro-Electronics Research Flanders (NERF), respectively, has published the largest network to date of connections between neurons in the cortex, where high-level processing occurs, and have revealed several crucial elements of how networks in the brain are organized. The results are published in the journalNature. "This is a culmination of a research program that began almost ten years ago. Brain networks are too large and complex to understand piecemeal, so we used high-throughput techniques to collect huge data sets of brain activity and brain wiring", stated R. Clay Reid, M.D., Ph.D., Senior Investigator at the Allen Institute for Brain Science. "But we are finding that the effort is absolutely worthwhile and that we are learning a tremendous amount about the structure of networks in the brain, and ultimately how the brain's structure is linked to its function." "Although this study is a landmark moment in a substantial chapter of work, it is just the beginning", stated Wei-Chung Lee, Ph.D., Instructor in Neurobiology at Harvard Medicine School and lead author on the paper. "We now have the tools to embark on reverse engineering the brain by discovering relationships between circuit wiring and neuronal and network computations." "For decades, researchers have studied brain activity and wiring in isolation, unable to link the two", stated Vincent Bonin, Principal Investigator at Neuro-Electronics Research Flanders. "What we have achieved is to bridge these two realms with unprecedented detail, linking electrical activity in neurons with the nanoscale synaptic connections they make with one another." "We have found some of the first anatomical evidence for modular architecture in a cortical network as well as the structural basis for functionally specific connectivity between neurons", Wei-Chung Lee added. "The approaches we used allowed us to define the organizational principles of neural circuits. We are now poised to discover cortical connectivity motifs, which may act as building blocks for cerebral network function." Wei-Chung Lee and Vincent Bonin began by identifying neurons in the mouse visual cortex that responded to particular visual stimuli, such as vertical or horizontal bars on a screen. Lee then made ultra-thin slices of brain and captured millions of detailed images of those targeted cells and synapses, which were then reconstructed in three dimensions. Teams of annotators on both coasts of the United States simultaneously traced individual neurons through the 3D stacks of images and located connections between individual neurons. "Part of what makes this study unique is the combination of functional imaging and detailed microscopy", stated R. Clay Reid. "The microscopic data is of unprecedented scale and detail. We gain some very powerful knowledge by first learning what function a particular neuron performs, and then seeing how it connects with neurons that do similar or dissimilar things." "It's like a symphony orchestra with players sitting in random seats", R. Clay Reid added. "If you listen to only a few nearby musicians, it won't make sense. By listening to everyone, you will understand the music; it actually becomes simpler. If you then ask who each musician is listening to, you might even figure out how they make the music. There's no conductor, so the orchestra needs to communicate." The paper titled "Anatomy and function of an excitatory network in the visual cortex" is available online.